Off The Mat Yoga and The Spine beyond The Spine as we know it! Do you know anything about the Spine beyond its physical characteristics? Am inspired to share some information that is not necessarily common knowledge about the spine although thousands of years old. Who knew about the Spine thousands of years ago? The ancient yogis of India believed that while we are growing in our mother’s belly, life force comes from Cosmic Energy via the Medulla Oblongata at the base of the skull and it flows up and down the spine till the end of our life on earth. They also believed that when we think and act in a naturally positive way, the Kundalini energy goes up the spine towards Higher Cosmic Consciousness where it came from. Of course, the Kundalini energy can stagnate or go down mirroring our life energy. So the spine is not just a functional part of the human body? That’s right! These yogis actually see it as a representation within us of the entire cosmos as chakras and that the more free flowing the energy is in the spine, the easier it is for our Kundalini energy to rise back upwardly to our source. This is one crucial reason why alignment is so very important in all forms of yoga practice. Kryia yoga especially promotes the Kundalini energy to go up. There are many ways to do Kryia Yoga. Some do it with rigorous breathing and body movements, while others use mental directions made available to those initiated who believe this way to be more efficient and powerful. Both physical and mental ways of energizing our Kundalini energy can be combined of course. 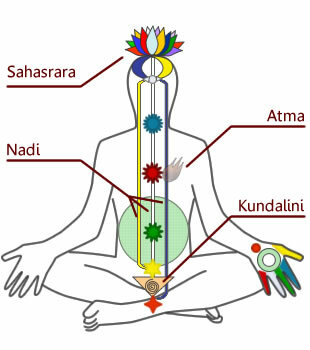 The important part here is that the spine is the container for the Kundalini energy which is connected to our state of awakening to Higher Consciousness. How can we nurture this Kundalini flow up the Spine? You can develop mindfulness around how you care for your body and your mind. You can learn to release straight into your support by letting the muscles around your skeleton be relaxed without loosing your skeletal height. Avoid muscular efforts with your back in the process. This way, you let the skeleton lengthen up and out from that support and the spine can expand into its full space. With these thoughts in mind, you can practice Yoga & Meditation, Tai Chi & Chi Gong and although you can get immediate results, deep changes happen in time. You can read books and listen to spiritual teachers that help with self understanding, with understanding of the world, and your place in it on a wide scale. At some point, it is good to choose a path and follow it as you would choose a road and stick to it if you were lost in a forest. Just remember that whatever you choose, it is not what you do that matters as much as how you do it and why.